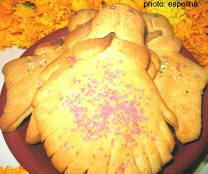 M exico's special Day of the Dead bread, known as pan de muerto might take you by surprise. We usually think of bread as the staff of <>life. But in Mexico, on Day of the Dead, the people give it a slightly more macabre take. This sweet bread, usually flavored with anise and orange, is made into the shape of skulls, crossbones, or dead folks and enjoyed with relish while sitting in the cemetery in the company of the souls of lost loved ones. You'll also find it in every ofrenda, the simple or elaborate altars lovingly created by hand and offered up to the memory of the loved ones who have passed on. 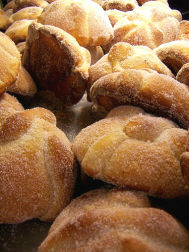 The Pan de Muerto is just one of the goodies placed on the altar to entice that missed soul to come home for a visit. In San Miguel de Allende, the panaderías, or bakeries, will be busy for days mixing, kneading, rolling and sugaring loaf after loaf of pan de muerto for the holiday. You'll see folks walking along the cobblestoned streets with baskets full of the luscious treat. But many families have their own recipe for Day of the Dead Bread and like to make it at home. Why not try it yourself? Mix 1 1/2 C. of the flour, the sugar, salt, yeast, anise seed and orange zest together in a large bowl. In a small pan, heat the milk, water and butter until butter melts. Add to the dry mixture. Mix well. Add the eggs one at a time, mixing well. Mix in 1 1/2 cups of additional flour. Beat well. Add the rest of the flour, little by little, until the dough is still soft but has lost its stickiness. Turn onto a floured board and knead about 10 minutes. Place the ball of dough in a greased bowl, cover with a cloth and set in a warm place to rise until doubled in size. Punch down and reshape, reserving about a quarter of the dough and forming "crossbones" shapes to put on top. Or make two smaller loaves, also with bone shapes on top. Or, if you prefer, form the dough into a skull shape, a doll, or whatever you like. Let rise another hour. Bake at 350 degrees F (175 degrees C) for about 40 minutes. Sprinkle with powdered sugar and/or colored sugar sprinkles and let cool, or brush with glaze. In a small pan, bring all ingredients to a boil and cook 2 minutes. Brush onto bread with a pastry brush and sprinkle immediately with colored sugar. Cool.